The Middle East is becoming the most-sought international travel destination in the world, reports Intrepid. 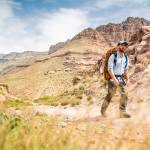 At the epicenter, Jordan is vying to become a global leader in outdoor adventure. And in 2017, the country hosted the first adventure tourism conference in the Middle East to accelerate that goal. 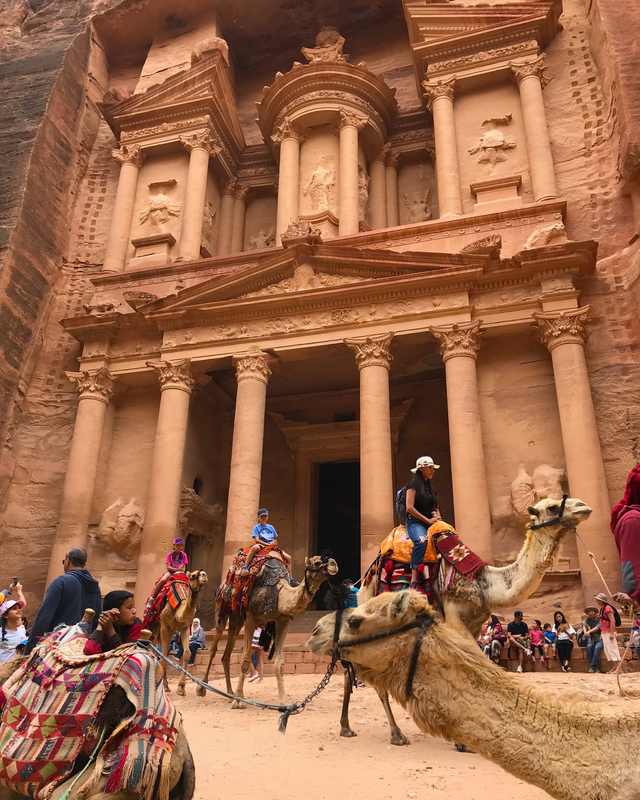 Jordan’s organized effort paid off: Last year, 40 new Jordanian adventure travel itineraries launched with everything from snorkeling to horseback riding, reported the Adventure Travel Trade Association. Two newly developed trails opened that span the entire length of the country: the Jordan Bike Trail and Jordan Trail. The routes invite wanderers to explore the land by foot or bike, supported or solo. Following the new travel options, tourism arrivals increased by 15 percent last year — in the first quarter alone — compared to 2017. And tour operators anticipate a revenue spike of another 13 percent this year. 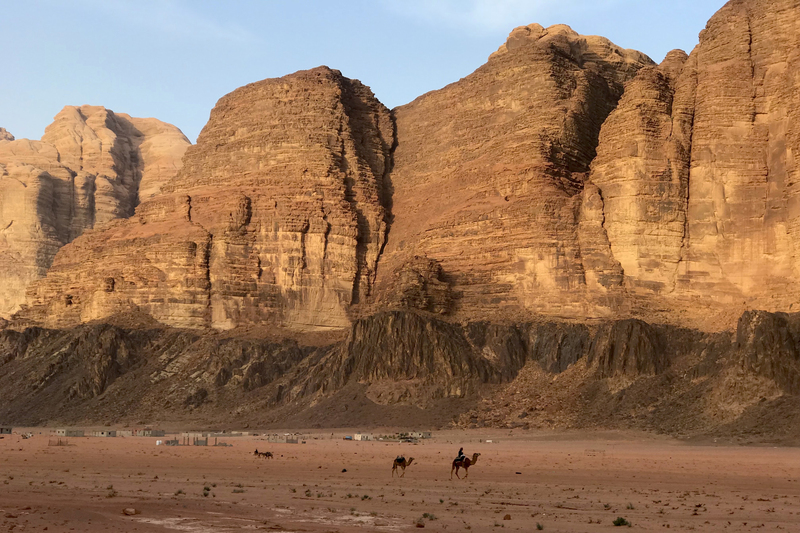 We’d be hard-pressed to find another place in the world with Jordan’s majestic combination of profound archaeology, warm culture, and rich terrain. If you’re considering taking your first adventure to the place where civilization was born, here are five hands-on experiences that are worth adding to your list. Mountain biking the Jordan Bike Trail (JBT) is a unique, human-powered way to plug into Jordan. On two wheels, you can interact with various terrain, neighborhoods, nomads, roaming animals, historic sites, and communities that you wouldn’t otherwise see by vehicle or foot. JBT launched in 2017 and is off the beaten path, and you won’t see many other travelers. The JBT is a 453-mile route that starts in the farmlands of Um Qais in the north. 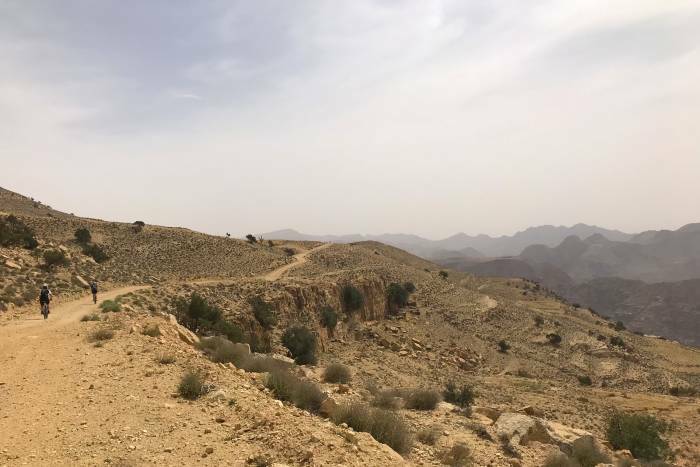 In the south, the trail passes deserts and ends in Aqaba, against the Red Sea. This non-technical ride mixes paved and dirt roads, and ping-pongs between the Jordan Valley and Mountain Heights Plateau. Bikers can organize a supported trip, join a tour, or go completely solo. One of my favorite sections of the JBT is in the 10th stage, from Petra to Abbasiya. We descended from Rajif to Delagha and crossed the desert to reach Al Humaimah, a desolate stopover that was used by camel caravans along the Spice Route centuries ago. Our oasis was a big tent where a Jordanian chef served us a fresh, picnic-style lunch. JBT runs the entire length of Jordan from the country’s northeast brim to its southeast corner. 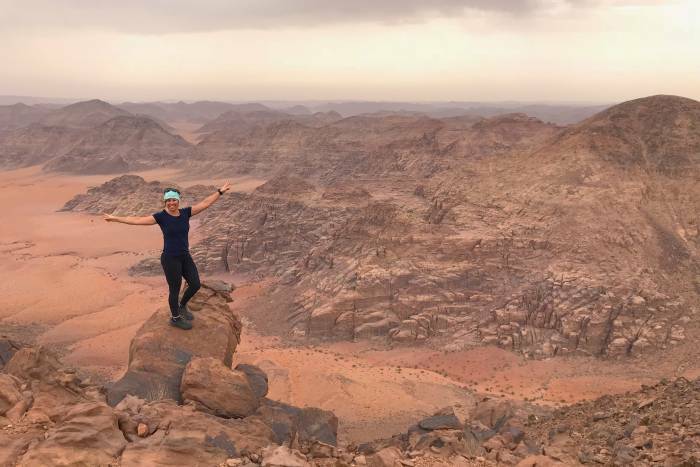 Experience Jordan, the adventure tour company that spearheaded the trail’s development, offers a supported nine-day trip featuring select sections of the JBT ($2,200 per person). And Cycling Jordan designs small group bike adventures, but the cost varies. The entire route takes about 12 days to finish at an average of 38 miles a day, according to Experience Jordan. Siq Al-Barid (aka “Little Petra”) is as magical and ancient as Petra but lesser-known. With few crowds, its even possible for you to wander these prehistoric cliff dwellings in solitude at sunset. 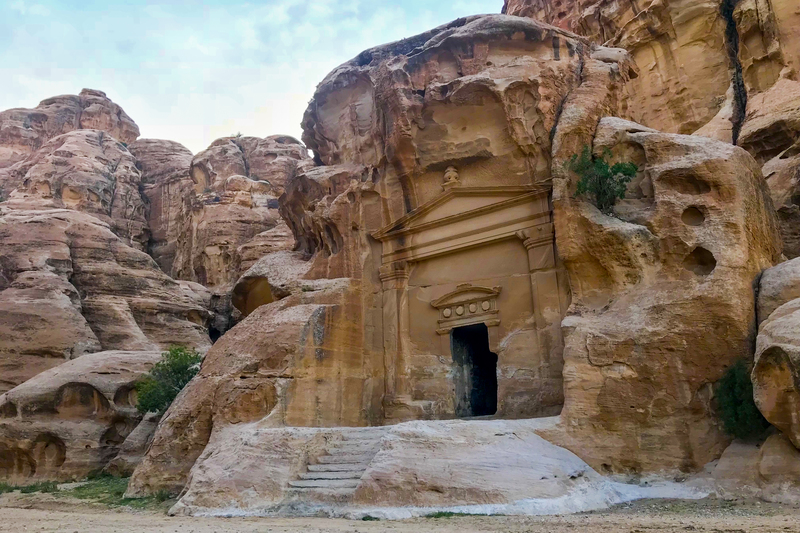 The UNESCO World Heritage Site is also home to one of the only remaining 2,000-year-old Nabataean frescoes in the country. “Little Petra was a trade post built in the first century (BC to AD). The narrow canyon at the entrance was chiseled out in sections to widen it. The opening was used to house and protect people and animals during a storm or if bandits were around,” said Jordanian tour guide Nader Saleh. On the other side of the ravine, sandstone cliffs are chiseled into multilevel temples, tombs, and homes alongside natural caves. “Historically, visitors paid respect to the main monument before doing trade business or relaxing,” Saleh explained. Sets of stairs are cut into the vertical rock, which you can climb to see the upper terraces. Little Petra is 6 miles north of Petra in southwest Jordan. Both sites sit in the Mountain Heights Plateau, a region separating the Jordan Valley from the eastern desert. I spent one and a half hours here, which felt rushed. Set aside at least two to three hours onsite. Wear hiking shoes with grippy outsoles that can help you ascend the sandstone stairs and scramble up nearby boulders. I was happy that I wore my Arc’teryx Acrux Approach Shoes. Wadi Rum Protected Area is a 286-square-mile UNESCO World Heritage Site in southern Jordan. T.E. Lawrence spotlights this otherworldly place as “vast, echoing, and god-like” — which is an accurate description. Luxury camping in Wadi Rum gives travelers time to relish the desolate multitoned sand dunes and gigantic granite spires. This community-centric glamping also connects you with local Bedouins, traditional Jordanian cuisine, and a hot shower. My friends and I met our camp host in Wadi Rum Village and Jeeped south across the rolling desert to our Bedouin campsite. Traditional goat-hair tents paralleled the base of a sandstone mountain. A giant butte jutted abruptly out of the vibrant red landscape — like all the geologic formations in the reserve. We scrambled to the summit for sunset and then devoured a delicious dinner: zarb, a traditional dish of meat and veggies slowly cooked beneath the embers of a campfire. Our day closed with lounging on pillows around a campfire, beneath the stars, and drinking bottomless cups of tasty, loose-leaf tea. No, really: Strong, sugared tea is the cultural staple in Jordan over alcohol. Wadi Rum Village is 70 miles south of Petra. The southern boundary of the preserve nearly reaches the northern border of Saudi Arabia. Fixed campsites vary from about $13 to $778 per night. Camp at least two nights in Wadi Rum. If you’re able to, combine glamping with a second night of guide-led backcountry camping. That way, you can scope out a larger breadth of the preserve. The highest point in Jordan delivers an unmatchable panorama of the contours and colors in the Wadi Rum Protected Area. Smooth, flat valleys of sand stretch like ultrawide rivers between rows of dark, nodular mountains shaped like pyramids. To the south, you can see the light glow of the mountains in northern Saudi Arabia. Also, at least 25,000 rock carvings and 20,000 inscriptions adorn the rock faces of Wadi Rum. Hiking is a way to discover those archaeological gems. First, we Jeeped south through Wadi Rum’s long, wide valley of Wadi Saabit. The sand pigments range from fire-engine red and honey gold to tangerine and ivory. Eventually, we reached the inconspicuous start of this out-and-back hike. There’s no trailhead, parking area, or signage to indicate the trail. To start, there’s a bit of routefinding and scrambling mixed into hiking. At the saddle, the rocky singletrack becomes distinct and zigzags up the slope to the 6,000-foot summit. In all, you climb about 1,400 feet from the valley floor to the top. This peak is in the southernmost reach of Wadi Rum Protected Area and neighbors Saudi Arabia. Terhaal Adventures guided my two-day, one-night backcountry trip. It offers a packaged multiday trip that includes this summit ($1,300-1,570), but you can inquire about any specific itinerary requests. You need one day to summit this mountain. But I recommend adding at least one night of backcountry camping along with the hike: The stars are glorious, and you’re bound to see free-roaming camels! It can be windy on the summit and on the drive across the dunes. Carry sunglasses and a headscarf to protect your skin and eyes if sand kicks around. Petra is one of the most prolific, extensive archaeological sites in the world. 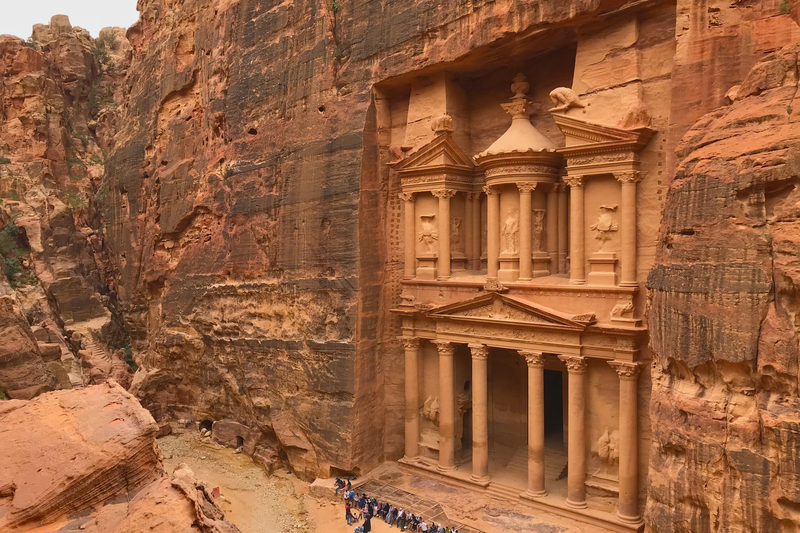 This UNESCO World Heritage Site is most famous for the elaborate Treasury, a 150-foot tall tomb that’s featured in “Indiana Jones and the Last Crusade.” However, at least 800 known structures are scattered over 100 square miles, reports National Geographic. Today, Petra’s ruins are larger than Miami and Oakland combined. But this rose-hued city dates back 2,000 years. At its reign, the bustling trade center supported 30,000 residents. Colonnaded streets, tombs, mountainside temples, courtyards, houses, shrines, and churches stretch across 400 square miles. The main entrance remains on the east side: the Siq, a shaft that’s 4,000 feet long, 260 feet high, and delivers you to the jaw-dropping Treasury. From the Treasury, follow the main trail (3.2 miles one way) through the center of the old capital. Pass The Basin Restaurant (stop for the excellent lunch buffet on the return) and ascend the winding steps to Al-Dayr (aka “The Monastery”), a magnificent temple on Petra’s westernmost edge. Petra is 66 miles north of the Wadi Rum Protected Area in southwestern Jordan. The old city is also 34 miles south of Dana village, which is adjacent to the Dana Biosphere Reserve. Entry fees range from 50 to 100 Jordanian Dinar (J.D.). (At print, 50 J.D. is about $70.) Go with a guide for at least one day to learn the history and cultural significance of this treasure. Stop by the New Museum of Petra, which is opening in 2019. One full day in Petra barely scratches the surface. You could spend two to three days exploring the carved buildings and surrounding spur trails. A big portion of Petra is wide open with zero shade. For sun protection, bring your big-brim hat and a neck gaiter, like a Buff. Adventure and backcountry travel around North America and the World.